that Southampton’s victims were Brighton offered us any small consolation. outcomes to the extent that we saw today. fry don’t tend to is a justified one. advantage of one of the counter attacking opportunities which came their way. City team or their supporters could thank them for. someone other than Hazard had been the “victim”? Somehow, I doubt it. making their task more difficult. maybe Chelsea’s best move of the game so far. rare goal from close range on the far stick. only saw two unmarked attackers getting their heads to the ball from a corner. To lose the win just at the stage where you had virtually convinced yourself that it could happen was tough, but a draw would still have been have been a very satisfactory outcome. only City weren’t thinking like that. The possibility that they could do a Southampton where they snatched a winner after being pulled back level very late on arrived as sub Kenneth Zohore burst on to a long ball and looked to have beaten visiting centre back Antonio Rüdiger only for the German international to bring him down as he bored down on goal. Having now seen the incident again on television, I think an argument could be made to say keeper Arrizabalaga might have got to the ball before Zohore, but it was a very close call and, on balance, I stick to my original view that a red card should have been shown. 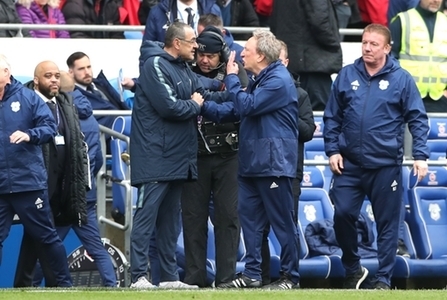 At this stage, I was thinking that there was nothing wrong with Chelsea’s equalizer and so thought, correctly I believe, that it was the decision not to send off Rüdiger that was responsible for the storm of boos which greeted Mr Pawson at the final whistle. After that incident and with Chelsea levelling things up so late on, there was, for me at least, a sense of inevitability about their winning goal when Loftus-Cheek got the better of Peltier to nod powerfully in from a Willian cross to secure an undeserved win for the visitors. Therefore, I was angry, but also had this thought that 1-0 up after 84 minutes to a 2-1 loss was the sort of turn around that relegation sides suffer as I turned my radio on to hear what the media had to say about the game. big officiating mistake of the game. outrageously poor call by a linesman. Although I had still not seen the goal for a second time, in a sense there was no need for me to do so, because the words I heard for an hour or so after the final whistle had blown made it so obvious that this was no borderline decision that an official had got wrong, but there was still general sympathy shown towards them because it was such a tough decision to make – this was a major howler. country, the answer is an emphatic no! league in the world” is disgraceful. may have thought the same as well. Before going on to explain what I mean, I should preface my remarks by saying that I thought Chelsea should have had a penalty from the first corner of the game when there was a clear shirt pull on a Chelsea player by Gunnarsson, but, if you are, say, Sean Morrison and you’ve played in yet another game where you have been fouled in the opposition penalty area on at least two occasions, can you blame him for thinking to himself here we go again after conceding a late equaliser from a clearly offside position and then seeing an opposing centreback stay on after committing a foul which should probably have been punished by a red card? No doubt this group of players will lift themselves again for the three successive away matches we now face because that is what they have done for two seasons and more, but they must know that they will travel to the Etihad on Wednesday in particular and not see many, if any, of the big calls which could go either way be called in their favour – as I mentioned earlier, it goes on all of the time in the Premier League, but seldom can the favouristism towards the big boys have been as obvious as it was today. Finally, I’d like to send my condolences to the family and friends of former City midfield player Barrie Hole who it was announced had passed away at the age of seventy six recently. Swansea born Hole played over two hundred games in City’s midfield between 1959 and 1966 before signing for Blackburn for a fee of forty thousand pounds. After two years at Ewood Park, he moved on to Villa before ending his career at Swansea – he played thirty times for Wales. To be honest, although I saw Hole play for us on many occasions, I was too young to appreciate what he brought to the team. That said, I can remember my father being a fan of his as he picked him out as one of the better footballers in a team that was generally struggling during the time I watched him play for City. *Ive watched Match of the Day 2 since typing this and feel even more now that City were robbed by the officials. As for the linesman, Jermaine Jenas named him as Eddie Smart – good on him for doing so, because Mr Smart does not deserve the anonymity that many doing his job get after that howler.